I realised I was in need of a new adventure when I felt jealous of one of my best friends. Envy is not an emotion I commonly feel, but when my friend and her family moved to a quiet seaside town to escape the treadmill, the niggling feeling started. She bought a house within walking distance to a beach, made effort to become part of the community, found a wonderful playgroup for her toddler and had time for yoga. Her husband was home from work every day by 5pm. Photos sent by email rubbed salt into the wounds; the happy family down by the river, walking along the beach, their son playing in the backyard with sun kissed hair. Here I was in cold, grey Melbourne juggling three kids under three and feeling housebound and inadequate. My toddler was throwing tantrums, my twins were running me haggard, my partner was rarely home from work before our children were in bed. But instead of letting the green-eyed monster takeover, I embraced it and took a good hard look at myself. By identifying why I was feeling jealous, it inspired me to change the status quo. 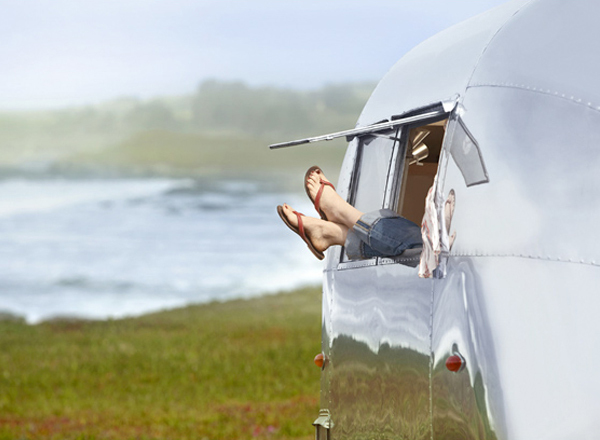 Hence our Airstream Adventure was born. We have a long way to go before we can hit the open road and chase the heat, but the biggest step has been taken – prioritising what matters most to us. In my case, it’s not about having a big house, money or possessions. It’s about spending quality time with our children while they’re young (and still want to know us), reducing our footprint and travelling. Luckily I have a partner with similar yearnings. In just a short period of time, we’ve bought our dream 1960’s Airstream and it is now half way through renovation. We’ve moved from living above our means in one of the trendiest pockets of Melbourne, over to my mother’s house in the burbs where the driveway is actually big enough to park an Airstream. And instead of drowning in bills, we’re planning a year-long road trip. At the top of our list of places to visit is my friend’s driveway down by the sea. Thanks Lou for unleashing the green-eyed monster. Fantastic. Lots of room to park our Airstream! Happy days, Son. I also look forward to hearing each instalment. Reading, even. We’ll be changing plenty of those too – I’m not sure where we’re going to store them in such a small space! Love the sketch on top! Look forward to hearing about your adventure! What really sticks in my head is how often when I’m dragging four kids through the grocery store, an old lady will come up to me and say something like, “I know it’s busy now, but the time goes so fast. Looking back on it, those were the happiest years of my life when my kids were little.” And every time, it gives me pause and sends my head in another direction beyond the frustration of the moment. Way to go for recognizing the situation you’re in, and most of all, doing something to improve your lives.